Bread pudding need not be sweet! Here, a savory version full of spinach and cheese works on a brunch buffet or as a casual dinner. And while the best part about this bread pudding is how insanely delicious it is, the fact that you can prep it entirely ahead of time and then pop it in the oven when you're ready to eat, is a close second. Feel free to try different cheeses or combinations of cheeses. You can also use other greens—just be sure to cook them until their liquid has evaporated and they're tender (10 minutes for chard, 15 minutes for kale) before adding them to the pudding. Cut the bread into 1-inch chunks and spread on a baking sheet. Put in the oven for about 10 minutes—you're just drying it out a bit, you don't want to toast it. Let the bread cool. If needed, rinse the spinach to remove any dirt or grit. Lift out of the water and drain in a colander or salad spinner. Meanwhile, peel and finely chop the garlic or shallot. Melt 2 tablespoons of the butter in a small frying pan over medium heat. Once the butter is melted, add the garlic or shallot and cook, stirring, until softened and gently fragrant, about 3 minutes. Add the cleaned spinach and 1/4 teaspoon of the salt. Cook, stirring, until the ​spinach is wilted, has released its liquid, and that liquid has evaporated, about 10 minutes. Set aside. Crack the eggs into a large bowl. Lightly beat or whisk. Add the milk and whisk to combine thoroughly. Stir in the remaining 1/4 teaspoon salt and the pepper. Set aside. Use the remaining 1 tablespoon butter to coat a large (9 x 13) baking dish. Add the bread cubes to the dish. Arrange the cooked spinach mixture in and on the bread cubes. 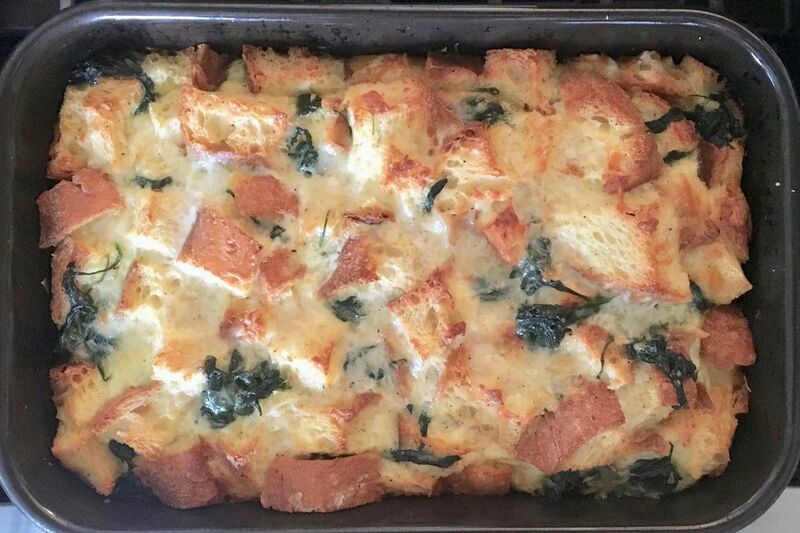 Sprinkle the cheese all over the bread and spinach. Pour in the egg-milk mixture; it should cover everything. If any bread cubes poke out, push them down into the liquid. Let the entire thing sit for at least 30 minutes (make ahead tip: cover and chill up to overnight; let it sit out for about 30 minutes before baking to take off the chill). Letting it all sit allows the bread time to soak up the egg-milk mixture, which will lead to a much better final texture than if you bake it right away. Bake until just a tiny bit jiggly in the center, but basically set everywhere else and browned along the edge, about 35 minutes. If it's still jiggly and getting too browned on top, cover with foil to cook a bit more.